Do you remember when Tamagotchi was popular here in America? I’m not afraid to admit it. I had one of the “boy”Â Tamagotchi. It was red, and it was actually a male puppy. 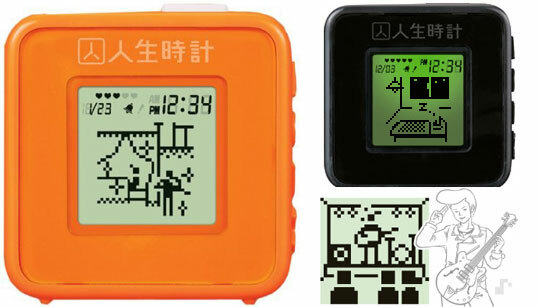 Even though Tamagotchi is back, and now in color for today’s youth, as an adult, you may not want to be seen with one. What do you do if you still want to have a virtual “pet” that can travel around on your keys? How abotu a Jinsei Tokei… otherwise known as Life Clock. Instead of a virtual pet, you are actually controlling a tamagotchi-like human. You have your choice of a salaryman, rockstar, or a schoolgirl. Instead of just feeding, and playing with your pet, with the Jinsei Tokei, you have to wake up on schedule, go to work, take people out on dates, go shopping, eat, and lots more. Get one at the Japan Trend Shop.